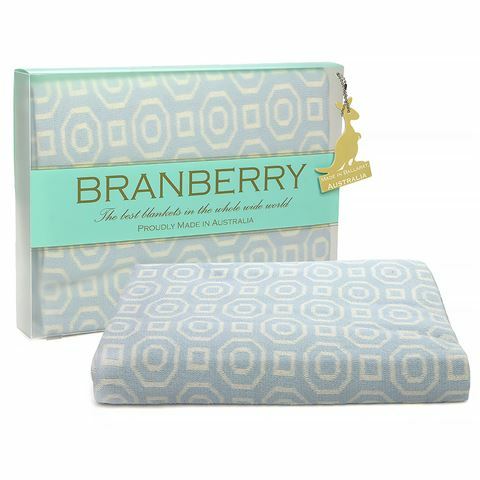 Knitted in Australia from only the finest Merino wool and combed cotton, Branberry blankets are as functional as they are beautiful. The natural fibres help regulate your baby’s temperature, keeping your little one totally comfortable all through the night – whether it’s summer or winter. And they’re soft on delicate young skin, too. Inspired by the geometric patterns of the 1930s is the Art Deco Cot Blanket, in two traditional shades. Edged in a matching colour, this blanket is perfect for tucking in your baby – its woolen blend means that it's wonderfully elastic, but it won’t stretch out of shape. Wonderfully elastic, but won't stretch out of shape.